Yes, that is definitely a Cicada Killer. The territorial behavior would indicate males, and the females are the ones that dig the burrows. As time goes on, you will see an increase in the number of males. Your yard is probably a well established lek. I wouldn't worry though, these guys are really non-aggressive towards humans. 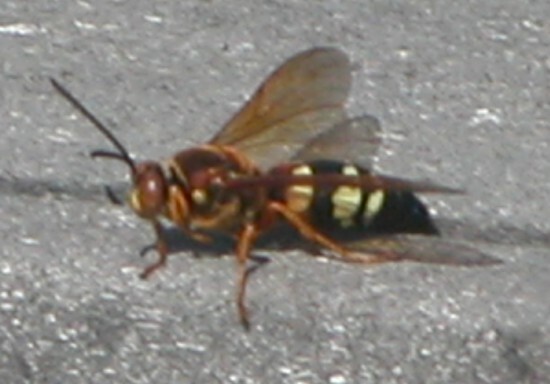 That male's stinger contains no venom and is only a barb at the end of the abdomen. The female's stinger has venom but the only way you would get stung by her is if you accidentally stepped on her. You should pull up a chair by a Cicada Killer's burrow and watch for her to bring in paralyzed cicadas.